NASA vitally needs new private spaceships, vehicles capable of carrying U.S. astronauts to and from the International Space Station (ISS), in order to maintain the future health of the massive orbiting laboratory. And they need them soon, agency officials said Friday (Sept. 16) in an industry forum. "Every year we do not have a commercial crew capability, the ISS is at risk," Philip McAlister, acting director of commercial spaceflight development at NASA Headquarters in Washington, stressed before an audience of private spaceflight industry representatives. But, there are still obstacles to overcome in the development of private spaceships that could one day carry astronauts to the space station and back. "We have to make sure industry has what it needs to be successful," McAlister said. McAlister and Brent Jett, deputy manager of NASA's commercial crew program, participated in the industry forum Friday to discuss the agency's strategy and goals to help support and foster development of these next-generation vehicles. "We continue to send money overseas to foreign providers to provide crew transportation services to ISS," McAlister said. "Compare that to where we are in cargo – three providers today, soon to be five providers for cargo. We have one provider today for crew. I think that somehow doesn't make sense." Artist rendering of Cygnus spacecraft approaching the International Space Station. Two companies in particular – the California-based SpaceX and Virginia-based Orbital Sciences – are expected to help fill the cargo void with their spaceships that will take food, hardware and other necessary supplies to the orbiting outpost. Test flights of SpaceX's Dragon capsule and Orbital's Cygnus freighter are part of NASA's Commercial Orbital Transportation Services (COTS) program, which has helped encourage the development of commercial cargo vehicles. SpaceX has already secured a $1.6 billion NASA contract for 12 unmanned supply flights to the orbiting lab. 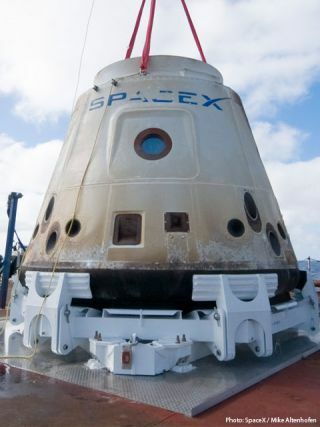 In December 2010, the company made its first orbital test flight with the Dragon capsule, which launched atop the firm's own Falcon 9 rocket. Orbital Sciences also has a cargo re-supply contract with NASA. The agreement totals $1.9 billion for eight flights using the company's robotic Cygnus capsule and Taurus 2 rocket, both of which are currently under development. Unmanned Russian Progress ships also play a critical role in bringing supplies to the space station, along with European and Japanese robotic spacecraft. But, a recent Russian rocket failure that resulted in the loss of the Progress 44 cargo spacecraft further highlighted the need to have several reliable systems in place to deal with unexpected anomalies, McAlister added. With NASA's announcement earlier this week of its plans for a new giant rocket, called the Space Launch System, for missions beyond low-Earth orbit, McAlister said the agency is making strides toward fulfilling its goals for the future. "I want to stress that together with our capabilities to do deep space exploration – Orion (Multi-Purpose Crew Vehicle, or MPCV) and [Space Launch System], we now have an integrated, complimentary strategy for NASA for exploration," McAlister said. "We definitely want to get moving forward."